Builders: British Power Boat Co. The Admiralty 35ft Fast Motor Boats (FMBs), built in vast numbers, were the larger sisters to the 25ft FMBs that were used on destroyer sized warships, the 35ft FMBs being fitted out either as Aircraft Tenders or Admirals Barges for the larger warships of the fleet. 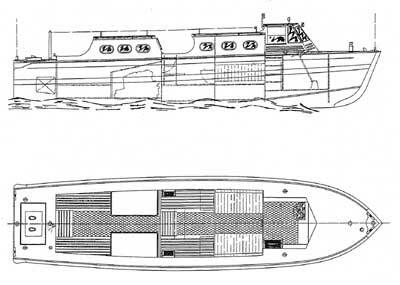 The identity of TARGET is not known, but it has been established her builder was British Power Boats, who built only 43 of this type for the Royal Navy. The construction is very similar to that of the 25ft FMBs and the layout of this type was very similar to that of the 37V2ft RAF seaplane tenders (ST 206), as can be seen from the thawing and photo of the type. The prototype was ordered on 12.02.35 for C-in-C North America & West Indies and after trials in May 1935 was allocated to HMS York. The craft, after serving on many ships as the flag barge, was returned to Bermuda for disposal as late as 1950. Further units served on HMS Royal Sovereign and HMS Southampton, and craft built in 1936, issued to HMS Courageous and HMS Glorious were all lost. As Admirals Barges, craft of this type were on HMS Cumberland, HMS Barham and HMS Birmingham, and as Aircraft Tenders 3 were on HMS Ark Royal when she was lost and 2 on HMS Gloucester, similarly lost. In fact only three of the batch of craft ever survived to be sold off. The last of this type were ordered in December 1938 from BPB and only 5 were known to have survived. 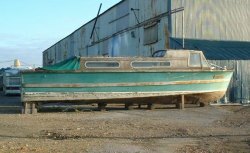 TARGET therefore can only be one of 15 survivors of the 43 built - and most money is on her being formerly the 38243 which was in use by the Sea Cadet Corps Medway Towns Unit in 1962, but this has yet to be confirmed. The BPB 35ft FMIB was officially listed as used for movement afloat of Naval personnel. The craft accomplished a wide range of duties and was particularly useful as equipment for the medium battle cruiser. The layout of the craft gave particular attention to Naval etiquette and the division of the compartments was so arranged as to give officers and ratings separate open and under cover accommodation. The forward cabin seated eight which was accessed from the centre cockpit which was fitted with batten type portable seats. The cabin itself was fitted out with deep sprung leather upholstered seats with padded squabs. The craft was noted for its remarkable low running noise and its maneuverability at all speeds.